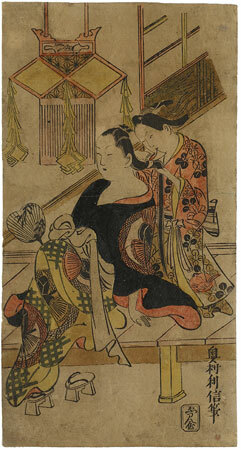 A kamuro is combing her mistress’s hair for the Buddhist all soul’s festival (Bon). In the background is a lantern for the soul of a deceased party. The beauty’s round fan and the open veranda indicate that the festival is in the summer. Such kiriko-dōrō lanterns, which are presumably of Chinese origin, can also be found in other woodblock prints of this period. On a veranda (engawa) a small maid is dressing her mistress up for the “All Souls Festival” (bon). In the background there is a hanging lantern (kiriko-dôrô), characteristic of this festival. These lanterns are lit for the souls of the dead in a family at the bon festival from the 13th to 16th of July. The oiran’s kimono is decorated with court caps and fence motifs, the girl’s with hagi and moon hares. Another impression of this woodblock, with another colour scheme, is to be found in the Tôkyô National Museum. The models for this picture were a woodblock by Okumura, Masanobu in the possession of the same museum, and a painting in which an identical figure of a woman is depicted in other surroundings. Toshinobu has changed the ornamentation on the robes, the lower part of the oiran’s robe, had added accessories, and changed the surroundings. Yet, Toshinobu succeeds in lending his figures a completely different expression. In contrast to Masanobu’s women, they appear austere and reserved. Similar kiriko-dôrô lanterns, probably of Chinese origin, can be seen in two further woodcuts. On one leaf by Torii, Kiyotomo (active between 1720-1730), the actor Ichikawa, Dankzô dances in front of a big kiriko-dôrô lantern, out of which the onnagata player Sanjô, Kantarô II is looking. The play itself cannot be identified, but we know that both actors performed together in the years 1715-1729 and that Danzô adopted the crest shown in this leaf in 1728. Thus, the print under discussion must be dated around 1728-1729. The second print by Toshinobu, the artist of our leaf, shows the onnagata Yamashita, Kinsaku in the role of Oiso-no-Tora. He played this role in 1727. Large lanterns on stage inspired Toshinobu in the years 1727-1729 to depict them in our print. The leaf comes from the Vever Collection, cat. III, (1977), no. 20.